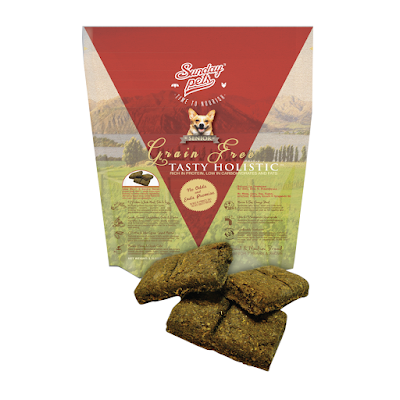 Sunday Pets Tasty Holistic range is quite unique as it uses a slow baking process at a lower heat, which should maintain nutrients and moisture. Their grain-free range covers all your puppy needs with two separate formulas aimed at the Small & Medium breeds and the Large & Giant breeds. Our dogs sampled the Adult (1-6 years) formula, which is marketed to the Small and Medium dog breed owners, however we could not see any issues feeding it to our larger Belgian Shepherds based on its range of ingredients and especially the high protein contents. 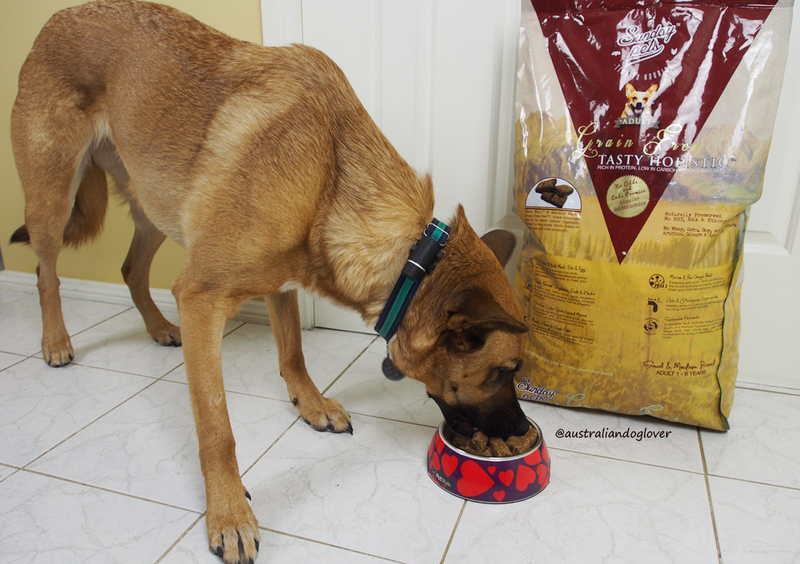 The Tasty Holistic range is grain-free, which is a growing trend with many brands now jumping on the bandwagon but this particular range has been on the Australian market for a couple of years now. Its top listed ingredients are Meat & Meal (79%) including Meat & Bone Meal, Free Range Lamb and Fish Meal which makes for a high protein food at 39%. This is great news if you have growing puppies, active or working dogs or dogs that need to put on weight quickly. A named sourced of whole protein as a topline ingredient would be preferable to meal in our view but there’s always a cost consideration... Sunday Pets actually provide a detailed percentage breakdown of all ingredients on the packaging, which is fairly rare and they should be applauded for their transparency. The 10% minimum of vegetables delivers a great range of vegetables like potato, carrot, pumpkin, celery with an 3.5% coming from fruit such as apples & blueberries. Tasty Holistic would not be a true New Zealand product without the addition of Manuka Honey (0.6%), Green-Lipped Mussel (0.3%) as well as Kelp, Flaxseed, Fennel, Molasses etc. The added Gluocosamine and Chondroitin are fantastic for those dogs suffering from canine arthritis. If you’re used to dry kibble (usually little pellets), be prepared for something a little bit different though the image on the front of the pack gives it away! The food comes as a rectangular biscuit (or a dense Weetabix) which you can easily snap in two. The average piece is quite substantial (12-13g) and measures around 5cm x 2cm. The detailed feeding guide on the back of the pack will advise you on the suitable amount for your dog (in grams or pieces per day) depending on their current levels of activity. Of course it also depends on what your aim is: are you trying to maintain your dog's current weight or is your pooch on the chubby side - like 45% of the Aussie dog population - and could stand to lose a few pounds? 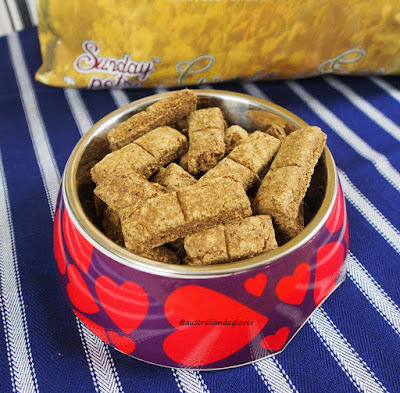 With our 3-year old bouncy Belgian Malinois twins, we opted for the active lifestyle option which recommended 330g/day and we fed this in 2 daily portions. For our older Belgian Tervueren (9.5 years) we chose the less active lifestyle option. The kitchen scales are getting a lot of action at the moment to ensure everyone receives their ideal allocation! The first thing we noticed is that our dogs needed to actively chew (rather than inhale) their food so these larger size biscuits have the benefit of slowing them down and make them use their teeth a lot more which is great for oral care! After two weeks, they have had no issues with digestion or bad breath which is always a great indicator of a quality food. RRP: $99.99 (11.81kg bag) from pet stores and online. Disclaimer: Product gifted by Sunday Pets for editorial consideration.